This is the first in what I'd like to become a series of posts touching on some of the landmarks in the history of animals that walk and talk like humans. We'll see how it goes. On October 10, 1980, Disney re-released the movie Song of the South to theaters. 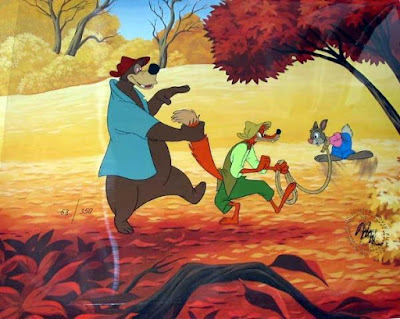 This is the film that transformed the anthro legends known as Br'er Rabbit, Br'er Bear, and Br'er Fox from folktale figures of the American South to cartoon characters able to hold their own alongside the likes of Mickey and Donald in kids' stuffed animal collections. If you want, you can buy this cel over here...! It was also, as far as I can recall and piece together, the first movie I ever saw in a theater. As a kid born in the late '70s in a pretty small south Georgia town...well, this makes sense. And while I first saw it during the fourth of five re-releases, there probably aren't a ton of Americans much younger than me who have ever seen the film in any sort of legitimate capacity, as Disney hasn't shown it in an official manner in the United States in decades...for, while the film is known for its excellent mixing of live action and animated footage and for the iconic song "Zip-a-Dee-Doo-Dah," it's also pretty well known for being too racist for Disney to embrace. Well...embrace fully, that is. Honestly, Song of the South is sort of a case study in how we Americans have no effing clue how we're supposed to approach our complicated racial history. Which is how we have stuff like this movie serving as the inspiration for a popular attraction at both of Disney's big American parks, yet we can't watch the whole thing outside of bootlegs and pieced-together segments on YouTube. It's been a while since I've seen the whole thing, so I won't attempt to give my own critique of the film's message other than to say that, yes, it's problematic. This article from ScreenCrush has a pretty good discussion of it. A summary: It could have been worse, considering that it was first released way back in 1946, but if you encounter someone who says there isn't a problem with it, they should probably think a little more. Those anthropomorphic animals sure are fun, though. My Halloween gaming - Ghostbusters!